4-2006 - this just in... with the recent addition of Dan Goldhardt's truck i have compared numbers on the SERT sticker and this truck and Dan's match. it is now easy to determine this truck should be a 413 W with single four barrel. talk about ultra rare! Steven Adams owns this beast. Steven writes "I traded half a 65 Barracuda for this truck at Wildcat Auto Wrecking. It is gold with black seats and stripes. 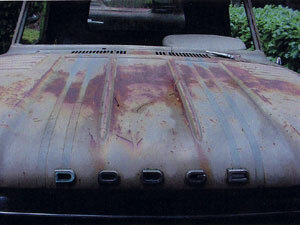 It is also a rust bucket. The only piece that i have not been able to locate thus far is a 1964 426. All other parts including donor 64 truck are now being worked on." 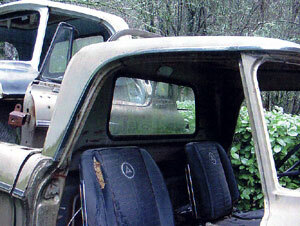 We look forward to seeing the old truck have some life breathed back into it - congrats on such a rare junk yard find!